Characterizing T-cell epitopes of pathogens that cause localized infections such as human papillomavirus is a challenge because of limited number of T cells in circulation. A method is described in which rare T cells were isolated and were characterized starting with a very small number of cells. Wang, X., Greenfield, W. W., Coleman, H. N., James, L. E., Nakagawa, M. Use of Interferon-γ Enzyme-linked Immunospot Assay to Characterize Novel T-cell Epitopes of Human Papillomavirus. J. Vis. Exp. (61), e3657, doi:10.3791/3657 (2012). A protocol has been developed to overcome the difficulties of isolating and characterizing rare T cells specific for pathogens, such as human papillomavirus (HPV), that cause localized infections. The steps involved are identifying region(s) of HPV proteins that contain T-cell epitope(s) from a subject, selecting for the peptide-specific T cells based on interferon-γ (IFN-γ) secretion, and growing and characterizing the T-cell clones (Fig. 1). Subject 1 was a patient who was recently diagnosed with a high-grade squamous intraepithelial lesion by biopsy and underwent loop electrical excision procedure for treatment on the day the T cells were collected1. A region within the human papillomavirus type 16 (HPV 16) E6 and E7 proteins which contained a T-cell epitope was identified using an IFN- g enzyme-linked immunospot (ELISPOT) assay performed with overlapping synthetic peptides (Fig. 2). The data from this assay were used not only to identify a region containing a T-cell epitope, but also to estimate the number of epitope specific T cells and to isolate them on the basis of IFN- γ secretion using commercially available magnetic beads (CD8 T-cell isolation kit, Miltenyi Biotec, Auburn CA). The selected IFN-γ secreting T cells were diluted and grown singly in the presence of an irradiated feeder cell mixture in order to support the growth of a single T-cell per well. These T-cell clones were screened using an IFN- γ ELISPOT assay in the presence of peptides covering the identified region and autologous Epstein-Barr virus transformed B-lymphoblastoid cells (LCLs, obtained how described by Walls and Crawford)2 in order to minimize the number of T-cell clone cells needed. Instead of using 1 x 105 cells per well typically used in ELISPOT assays1,3, 1,000 T-cell clone cells in the presence of 1 x 105 autologous LCLs were used, dramatically reducing the number of T-cell clone cells needed. The autologous LCLs served not only to present peptide antigens to the T-cell clone cells, but also to keep a high cell density in the wells allowing the epitope-specific T-cell clone cells to secrete IFN-γ. This assures successful performance of IFN-γ ELISPOT assay. Similarly, IFN- γ ELISPOT assays were utilized to characterize the minimal and optimal amino acid sequence of the CD8 T-cell epitope (HPV 16 E6 52-61 FAFRDLCIVY) and its HLA class I restriction element (B58). The IFN- γ ELISPOT assay was also performed using autologous LCLs infected with vaccinia virus expressing HPV 16 E6 or E7 protein. The result demonstrated that the E6 T-cell epitope was endogenously processed. The cross-recognition of homologous T-cell epitope of other high-risk HPV types was shown. This method can also be used to describe CD4 T-cell epitopes4. By performing an IFN-γ ELISPOT assay with a CD8 T cell line established from Subject 1, HPV 16 E6 46-70 region was determined to contain a T-cell epitope1 (Fig. 2), and the epitope-specific T cells were selected on the basis of IFN-γ secretion prior to starting this protocol (Fig. 1). Prepare the feeder cell mixture by combining irradiated (4,000 rad) allogeneic peripheral blood mononuclear cells (PBMCs) at 5 x 105 cells/ml, irradiated (5,000 rad) allogeneic LCLs at 5 x 104 cells/ml, and phytohaemagglutinin (PHA) at 0.1 μg/ml using complete Yssel's medium which contains 1% pooled human serum. The cells should be handled under sterile conditions throughout the protocol. Serially dilute the isolated epitope-specific T-cells (Fig. 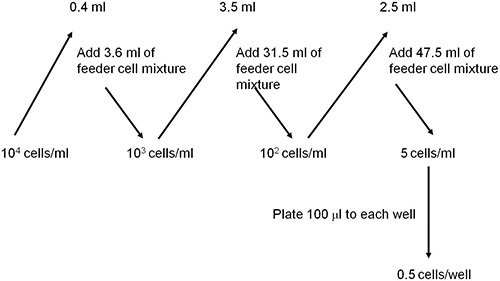 3) using the feeder cell mixture until the concentration reaches 0.5 cell/100 μl or 5 cells/1 ml. Use approximately 3 x 103 epitope-specific T-cells. Plate 100 μl/well of diluted epitope-specific T-cells into a total of 30 to 60 96-well round bottom plates using a multichannel pipettor. Incubate the plates in an incubator at 37 °C, 5% CO2. On Day 5, add 100 μl of complete Yssel's medium containing 20 u/ml of recombinant human interleukin-2 (rhIL-2). Visually identify growing T-cell clones in the 96-well round bottom plates by their large pellet sizes at the bottom. On Day 11 to 14, prepare a new feeder cell mixture by combining irradiated (4,000 rad) allogeneic PBMCs at 1 x 106 cells/ml, irradiated (5,000 rad ) allogeneic LCLs at 1 x 105 cells/ml, and PHA at 0.1 μg/ml using complete Yssel's medium. Plate this new feeder cell mixture into a 24-well plate at 1 ml/well. Aspirate the T-cell clones individually from each well using a micropipettor which can hold about 200 μl of volume. Dispense the T-cell clones individually into the 24-well plate containing the new feeder cell mixture. Repeat until all T-cell clones are transferred. Coat 2 sterile ELISPOT plates (Multiscreen-HA; Millipore, Bedford, MA) with 50 μl/well of primary anti-IFN-γmonoclonal antibody (clone D1K, Mabtech, Stockholm, Sweden) diluted to 5 μg/ml in sterile tissue culture grade phosphate-buffered saline (PBS) for a minimum of 1 hr in 4 °C. Wash wells with 150 to 200 μl/well of PBS by plating and discarding. Repeat three more times. Block non-specific binding by plating 50 μl/well of pooled human serum diluted to 5% using RPMI 1640 for at least 1 hr at 37 °C, 5% CO2. Disperse any large bubbles by popping them with a sterile needle. Plate 1 x 105 autologous LCLs2 in 50 μl of RPMI 1640 with 5% human serum per well. Mix cells in each well in the 24 well plate containing T-cell clones using a 1 ml pipet. Transfer 100 μl per well to a sterile Eppendorf tube. Add 500 μl of RPMI 1640 with 5% pooled human serum to each Eppendorf tube, and spin in a microfuge at 3,000 RPM for 5 min. Decant the Eppendorf tubes, add 110 μl of RPMI 1640 with 5% human serum per tube, and resuspend the cells using a vortex. Plate 50 μl each of media containing a particular T-cell clones, regardless of cell numbers for rapid screening, in identically positioned wells of the 2 plates. Repeat for all T-cell clones. By eliminating the cell counting steps, a large number of T-cell clones can be tested at once. Combine remaining media from several Eppendorf tubes, and plate 50 μl each to the next identically positioned wells to be used as a positive control wells to which PHA will be added. Add 50 μl each of RPMI 1640 with 5% pooled human serum to each well which would serve as a negative control well, not containing T-cell clones. Add peptides contained in the positive region (Table 1) in 50 μl/well to a final concentration of 10 μM/peptide. The peptide stocks are dissolved at 5mM each in 5% - 15% dimethyl suphoxide in PBS depending on peptide solubility. Each well will contain 200 μl in volume (50 μl of blocking, 50μl of LCLs, 50μl of T-cell clones, and 50μl of peptides). Add 50 μl of PHA (final concentration 10 μg/ml) to the positive control wells. Add 50 μl of RPMI 1640 with 5% pooled human serum to the negative control wells. Wash wells with 150 to 200 μl/well of PBS with 0.05% Tween-20 by plating and discarding. Repeat three more times. Add 50 μl of PBS containing 1 μg/ml of the biotin-conjugated anti-IFN-γ monoclonal antibody (clone 7B-6, Mabtech), and incubate at 37 °C, 5% CO2 for 2 hr. Disperse any large bubbles by popping them with a needle. Twenty min prior to the end of 2 hr incubation, prepare the avidin-bound biotinylated horseradish peroxidase H (Vectastain Elite ABC kit; Vector Laboratories, Inc., Burlingame, CA) by adding 2 drops each of solution A and solution B to 5 ml of PBS containing 0.1% Tween-20. Wash wells with 150 to 200 μl/well of PBS with 0.1% Tween-20 by plating and discarding. Repeat three more times. Plate 50 μl/well of the biotinylated horseradish peroxidase H, and incubate at 37 °C, 5% CO2 for 1 hr. Disperse any large bubbles by popping them with a needle. Plate 50 μl/well of a coloring reagent called stable diaminobenzidine (DAB) at room temperature for 5 min. Disperse any large bubbles by popping them with a needle. Wash wells with 150 to 200 μl/well of deionized water by plating and discarding. Repeat two more times. Allow the plate to dry completely. Count spots using a dissecting microscope or an automated ELISPOT reader (AID ELISPOT Classic Reader; Autoimmun Diagnostika GmbH, Strassberg, Germany). Select well-growing T-cell clones. Perform an ELISPOT assay as described above except that 1 x 105 autologous LCLs and 1 x 103 T-cell clone cells per well will be plated along with one each of the three peptides contained in the region (Table 1) at 10 μM. Set up the assay in duplicate or triplicate. Select well-growing T-cell clones. Perform an ELISPOT assay as described above except that 1 x 105 autologous LCLs infected with recombinant vaccinia virus expressing HPV 16 E6, E7 6 (prior to assay) or none (wild-type, strain WR) (multiplicity of infection of 5 for 1 hr) and 1 x 103 T-cell clone cells per well will be plated. Select well-growing T-cell clones. Perform an ELISPOT assay as described above except that 1 x 105 autologous LCLs and 1 x 103 T-cell clone cells per well will be plated along with one of the series of overlapping 9-mer peptides covering the region (Table 1) at 10 μM (Fig. 6a). Perform an ELISPOT assay as described above except that 1 x 105 autologous LCLs and 1 x 103 T-cell clone cells per well will be plated along with one of the series of peptides of varying length (Table 1) at 10 μM (Fig. 6b). Perform an ELISPOT assay as described above except that 1 x 105 autologous LCLs and 1 x 103 T-cell clone cells per well will be plated along with a few peptides most likely to contain the minimum and optimal amino acid sequence. These peptides will be tested at concentrations range from 10-5 M to 10-10 M (Fig. 6c). Select well-growing T-cell clones. Perform an ELISPOT assay as described above except that 1 x 103 T-cell clone cells per well will be plated along with the minimal and optimal peptide at 10 μM. One hundred thousand allogeneic LCLs per well sharing one or two HLA class I molecules with the subject being studied will also be plated. Select well-growing T-cell clones. Perform an ELISPOT assay as described above except that 1 x 103 T-cell clone cells per well will be plated along with peptides (10 μM) containing homologous amino acid sequences from other high-risk HPV types (Table 2). One hundred thousand autologous LCLs per well and allogeneic LCLs expressing the restricting HLA class I molecules will also be plated in respective wells. Subject 1 being presented here was a 22 year-old African-American woman with a recent history of high-grade squamous intraepithelial lesion diagnosed by a biopsy. She presented to be treated by loop electrical excision procedure on the day the T cells were collected1. The ELISPOT assay of her CD8 T-cell line showed that the HPV 16 E6 46-70 region (each region is tested with 3 overlapping 15-mer peptides) contained a T-cell epitope (Fig. 2). The number of epitope-specific T cells selected on the basis of IFN-γ secretion was 1.2 x 105. After performing limiting dilution (Fig. 3) on one fifth of the selected cells, 262 T-cell clones were harvested. The remaining selected cells were not used since the first attempt at T-cell cloning was successful. The high throughput screening ELISPOT assay performed on 94 of these clones identified 62 screen-positive clones which can easily be identified in the ELISPOT plate macroscopically. The remaining T-cell clones were not tested since the first ELISPOT assay identified peptide-specific T-cell clones. 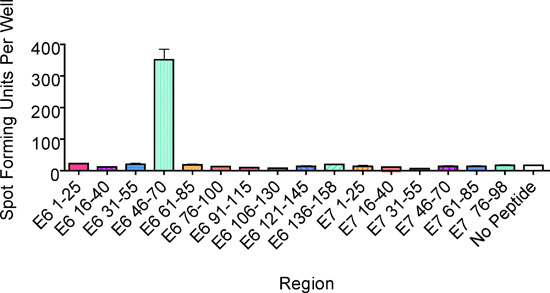 Eight well-growing screen-positive clones were retested with the three 15-mer peptides covering the region individually (Fig. 4). All of the T-cell clones were positive with the HPV 16 E6 51-65 peptides, 6 of 8 clones were positive with the E6 46-60 peptide, and none of the clones were positive with the E6 56-70 peptide. Testing with autologous LCLs infected with a recombinant vaccinia virus expressing HPV 16 E6 protein or E7 protein demonstrated that the T-cell clones recognize an endogenously processed E6 epitope (Fig. 5). Testing with a series of overlapping 9-mer peptides covering the HPV 16 46-65 region (Table 1) demonstrated the best response with the E6 53-61 peptide (Fig. 6a). The two 10-mer peptides containing the E6 53-61 peptide, two 8-mer peptides contained in the E6 53-61 peptide, and one 11-mer peptide containing the two 10-mer peptides were tested, and the E6 52-61 (10-mer) peptide was the minimal and optimal sequence most consistently (Fig. 6b). However, the E6 53-61 (9-mer) peptide had equally strong response with the T-cell clone #79. This T-cell clone was tested with these two peptides at a wider concentration range, and the E6 52-61 (10-mer) peptide retained positivity much more effectively than the E6 53-61 (9-mer) peptide at lower peptide concentrations (Fig. 6c). The longer E6 52-62 (11-mer) peptide was not tested since the goal was to define the shortest sequence that demonstrates a robust response. The E6 52-61 (10-mer) peptide was determined to contain the minimal and optimal sequence. The restricting HLA class I molecule of the CD8 T-cell epitope can be examined using an ELISPOT assay that uses allogeneic LCLs which express one or two HLA class I molecules common with the subject. However, the results were inconclusive for Subject 1 due to a high background seen in the ELISPOT assay. The HLA class I restricting molecule for Subject 1 was subsequently identified to be B58 using a chromium release assay (data not shown). Fig. 7 shows an example from another subject [Subject A who was found to detect minimal and optimal sequence of E6 75-83 (KFYSKISEY) as described by Wang et al.]7. High positivity is seen with an LCL expressing the B62 and Cw3 molecules, while background positivity is shown with an LCL expressing Cw3. A chromium release assay confirmed that the B62 molecule was the restricting element for Subject A7. Some regions of the HPV genome are well conserved, and homologous sequences to the HPV 16 E6 52-61 regions were present in 13 other high-risk HPV types (Table 2). Strong cross-recognition (>50% of spot forming units for HPV 16 E6 52-61 peptide) was demonstrated for 8 of 13 high-risk HPV types (Fig. 8). Figure 1. Overall scheme outlining the series of experiments characterizing novel T-cell epitope(s). This paper describes the protocol starting from the third box from the top. Figure 2. 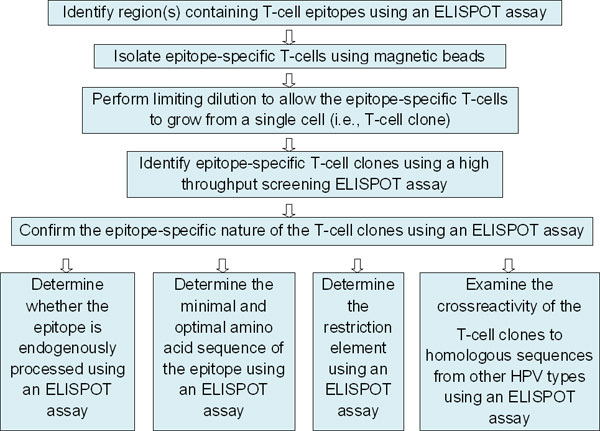 An ELISPOT assay performed to identify region(s) containing the T-cell epitope. One hundred thousand CD8 T cells stimulated in vitro per well were plated along with three 15-mer overlapping peptides (10 μM each) covering each region within HPV 16 E6 and E7 proteins. This example from Subject 1 showed the presence of a T-cell epitope in the E6 46-70 region. The bars represent standard errors of the means. Figure 3. A scheme showing how to dilute epitope-specific T cells using a feeder cell mixture to a concentration of 0.5 cells per well. Figure 4. An ELISPOT assay performed to identify sub-regions containing the T-cell epitope by testing the three 15-mer peptides individually. This example from Subject 1 showed the presence of the epitope in the E6 46-60 and E6 51-65 sub-regions. The bars represent standard errors of the means. Figure 5. An ELISPOT assay performed to examine whether the T-cell epitope is endogenously presented. This example from Subject 1 revealed that the T-cell clones recognized an endogenously processed E6 epitope. The bars represent standard errors of the means. Figure 6. ELISPOT assays performed to characterize the shortest and optimal peptide sequence of the T-cell epitope. The same clones were used throughout if available. (a) An ELISPOT assay performed using overlapping 9-mer peptides. This example from Subject 1 revealed that the epitope exists in the E6 53-61 subregion. 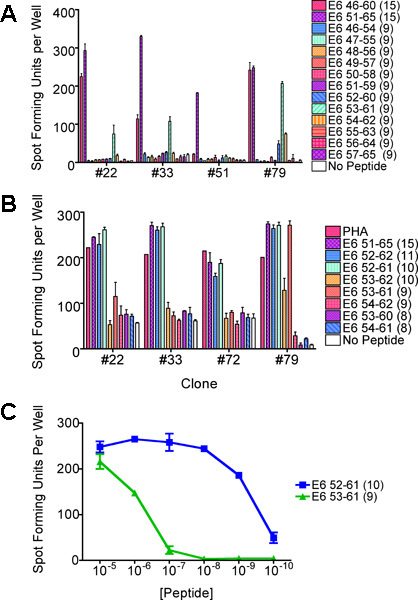 (b) An ELISPOT assay performed to identify the minimal and optimal peptide sequence using peptides of various lengths. This example revealed that the shortest and optimal peptide sequence was most consistently the E6 52-61 peptide followed by the E6 53-61 peptide. (c) An ELISPOT assay performed to confirm which peptide contains the minimal and optimal sequence. The E6 52-61 peptide retained positivity at lower concentrations, and was determined to be the shortest and optimal sequence. The bars represent standard errors of the mean. Figure 7. An ELISPOT assay performed to identify the restricting HLA class I molecule. This example supported the notion that the B62 molecule is the restriction element for Subject A's CD8 T-cell clone recognizing the HPV 16 E6 75-83 epitope7. This was confirmed by a chromium release assay. The bars represent standard errors of the means. Figure 8. 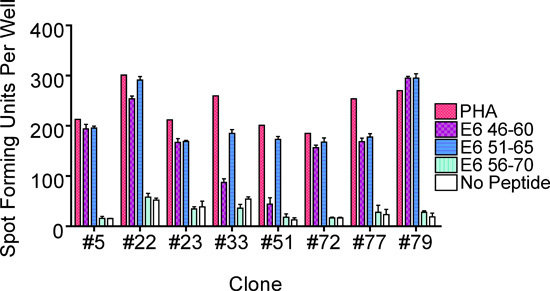 An ELISPOT assay performed to assess the cross-reactivity of the HPV 16 52-61 specific T-cell clones to similar sequences from other high-risk HPV types (Table 2). This example from Subject 1 demonstrated significant cross-reactivity (>50% of positivity compared to HPV 16 52-61) in 8 of the 13 other high-risk HPV types examined. The bars represent standard errors of the means. * The number of amino acids is shown in the parenthesis. Table 1. Amino acid sequences of HPV 16 E6 peptides used to define the minimal and optimal antigenic peptide sequence. ^ Amino acid residues different from those in the HPV-16 E6 52-61 epitope are shown in boldface type. Table 2. Amino acid sequences of peptides, of high-risk HPV types homologous to the HPV 16 E6 52-61 CD8 T-cell epitopes, tested to assess cross-recognition. Traditionally, immunologists attempted to characterize novel T-cell epitopes by stimulating the T-cells of interest in vitro, and performing a limiting dilution experiment to isolate the epitope-specific T-cell clones. Then the T-cell clones were characterized using a chromium release assay 8,9. However, many attempts were unsuccessful because the frequencies of the T-cells may have been too low to be isolated or because not enough T-cell clone cells were available to complete the characterization. The method described here overcomes these limitations by (1) assessing whether there is a sufficient number of T-cells of interest, (2) increasing the frequencies of the T-cells of interest by selecting them on the basis of IFN-γ secretion, and (3) using a small number of T-cell clone cells by performing ELISPOT assay in which autologous LCLs are seeded together with the T-cell clone cells. Fig. 2 shows an example of an ELISPOT assay performed not only to identify region(s) within which potential T-cell epitopes exist, but also to assess the frequency of the epitope-specific T-cells. The estimated number of the epitope-specific T-cells can be calculated by subtracting the spot forming units of no peptide negative control from the spot forming units in the region of interest. Multiplying this frequency with the number of cells still available for analysis will provide the estimated number of epitope-specific T-cells. In our experience, it is worthwhile to proceed further if this number is ≥ 2,500 cells. Then, a commercially available magnetic isolation kit can be used to isolate the epitope-specific T-cells based on IFN-γ secretion. The critical step is how the T-cells are allowed to grow after the limiting dilution steps. The environmental conditions under which the T-cell clone cells are growing need to be kept constant in order for them to grow from a single cell. A dedicated incubator should be used, and opening and closing should be kept to the absolute minimum. We add allogeneic LCLs to the feeder cell mixture in order to enhance T-cell growth through antigenic stimulation; however, this is not absolutely necessary since other investigators grow T-cell clones in irradiated allogeneic PBMCs only10. 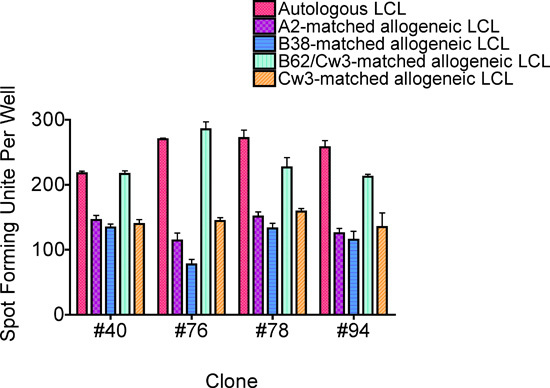 The number of T-cell clone cells needed for the characterization of the epitope(s) is drastically reduced to 1,000 cells by adding autologous LCLs to the same wells. Five-hundred T-cell clone cells per well can be used as well. It should be noted that there is no genetic proof of the clonality of these cells. However, the maintenance of their phenotypes and functional characteristics after an extended period in culture suggests their clonality in most cases. On occasion, it is possible to see diminishing response as seen for clone #51 between Fig. 4 and Fig 6a. This may be due to contamination with non-epitope specific T-cells which grew more robustly than the epitope-specific T-cell clone cells. Examples from Subject 1, detailed in Figs. 2, 4, 5, 6, and 8, are shown to demonstrate how this protocol works. A novel epitope HPV 16 E6 52-61 restricted by the HLA class I molecule, B58, was described. However, the E6 52-61 epitope restricted by other HLA class I molecules (B35 and B57) have been described previously 11,12. Such a phenomenon is known as an HLA class I binding promiscuity, and this has also been described in human immunodeficiency virus13-15. Therefore, whether the epitope being described is novel cannot be determined until the analyses are complete. In this Subject 1, the attempts to identify the restricting molecule using an ELISPOT assay was not fruitful due to a high background level. An example with a CD8 T-cell clone recognizing the HPV 16 E6 75-83 epitope from another individual (Subject A) was shown (Fig. 7). This problem of a high background in ELISPOT plate is encountered occasionally with restriction mapping, and is believed to be due to T-cell clone cells presenting the peptide antigens to themselves. Using fewer numbers of T-cell clone cells maybe an option to decrease the background, but it is always a good idea to confirm the result with a chromium release assay if a sufficient number of the T-cell clone cells are available 7,12. Not only can the result be confirmed regarding the HLA restricting element, but the cytotoxic nature of the epitope-specific T-cells can be demonstrated. The ELISPOT assay can also be used to assess whether the epitope-specific T-cells can recognize similar sequences from other HPV types (Table 2 and Fig. 8). However, the limitation is that it does not assess whether these sequences in other HPV types represent endogenously processed epitopes. The method described here is useful in identifying T-cell epitopes of low frequency T-cells and it is not only able to characterize CD8 T-cell epitopes, but also CD4 T-cell epitopes4. This study was supported by an American Cancer Society Scholars Award (RSG-06-180-01-MBC) and NIH grants (R01 CA143130 and UL1RR029884). Nakagawa, M. A favorable clinical trend is associated with CD8 T-cell immune responses to the human papillomavirus type 16 e6 antigens in women being studied for abnormal pap smear results. J. Low. Genit. Tract Dis. 14, 124-129 (2010). Walls, E., Crawford, L. Lymphocytes: A practical approach. Klaus, G. G. B. IRL Press. 149-149 (1987). Nakagawa, M., Kim, K. H., Moscicki, A. B. Patterns of CD8 T-cell epitopes within the human papillomavirus type 16 (HPV 16) E6 protein among young women whose HPV 16 infection has become undetectable. Clin. Diagn. Lab Immunol. 12, 1003-1005 (2005). Wang, X., Santin, A. D., Bellone, S., Gupta, S., Nakagawa, M. A novel CD4 T-cell epitope described from one of the cervical cancer patients vaccinated with HPV 16 or 18 E7-pulsed dendritic cells. Cancer Immunol. Immunother. 58, 301-308 (2009). Larsson, M. A recombinant vaccinia virus based ELISPOT assay detects high frequencies of Pol-specific CD8 T cells in HIV-1-positive individuals. AIDS. 13, 767-777 (1999). Nakagawa, M. Cytotoxic T lymphocyte responses to E6 and E7 proteins of human papillomavirus type 16: relationship to cervical intraepithelial neoplasia. J. Infect. Dis. 175, 927-931 (1997). Wang, X., Moscicki, A. B., Tsang, L., Brockman, A., Nakagawa, M. Memory T cells specific for novel human papillomavirus type 16 (HPV16) E6 epitopes in women whose HPV16 infection has become undetectable. Clin. Vaccine Immunol. 15, 937-945 (2008). Evans, M. Antigen processing defects in cervical carcinomas limit the presentation of a CTL epitope from human papillomavirus 16 E6. J. Immunol. 167, 5420-5428 (2001). Shi, Y., Smith, K. D., Kurilla, M. G., Lutz, C. T. Cytotoxic CD8+ T cells recognize EBV antigen but poorly kill autologous EBV-infected B lymphoblasts: immunodominance is elicited by a peptide epitope that is presented at low levels in vitro. J. Immunol. 159, 1844-1852 (1997). Varadarajan, N. A high-throughput single-cell analysis of human CD8+ T cell functions reveals discordance for cytokine secretion and cytolysis. The Journal of Clinical Investigation. (2011). Nakagawa, M., Kim, K. H., Moscicki, A. B. Different methods of identifying new antigenic epitopes of human papillomavirus type 16 E6 and E7 proteins. Clin. Diagn. Lab Immunol. 11, 889-896 (2004). Nakagawa, M., Kim, K. H., Gillam, T. M., Moscicki, A. B. HLA class I binding promiscuity of the CD8 T-cell epitopes of human papillomavirus type 16 E6 protein. J. Virol. 81, 1412-1423 (2007). Brown, S. A. T cell epitope "hotspots" on the HIV Type 1 gp120 envelope protein overlap with tryptic fragments displayed by mass spectrometry. AIDS Res. Hum. Retroviruses. 21, 165-170 (2005). Masemola, A. M. Novel and promiscuous CTL epitopes in conserved regions of Gag targeted by individuals with early subtype C HIV type 1 infection from southern Africa. J. Immunol. 173, 4607-4617 (2004). Walker, B. D., Korber, B. T. Immune control of HIV: the obstacles of HLA and viral diversity. Nat. Immunol. 2, 473-475 (2001).